There was a time when business focused purely on brand and haphazardly executed marketing tactics that a team would come up with. But can you imagine that happening today - if data weren’t central to making marketing decisions? We can make informed choices that lead to predictable results today precisely because data is central to all aspects of demand generation and performance marketing. How amazing is it that we’re able to instantaneously pull up numbers across a variety of variables and look into the specifics of those numbers? In the recent past, marketers worked hard to refine and build many systems geared toward the ease and fluidity of our data-driven marketing efforts, thus allowing us to be such efficient marketers. However, while the benefits of clean data are clearly established, B2B organizations continue to struggle with their databases. 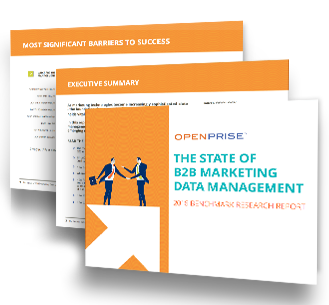 Research from the Demand Gen Report shows that 49% of B2B companies said improving the depth and accuracy of their data is a priority for them, and 42% of marketers said the quality of their database makes performance measurement more challenging. The database is core to our ability to operate and therefore keeping it in good shape should be a top priority. Your personal data may be transferred to, stored at and processed by us outside the country in which you reside, including, but not limited to the United States, where data protection and privacy regulations may not offer the same level of protection as in other parts of the world. We would also like to use automated decision-making and/or profiling in regard to your personal data for some services and products, for example calculate a score for how closely you fit our ideal customer profile.